First things first, Before going out and buying a water heater insulation blanket take a look at your water heater temperature thermostat. 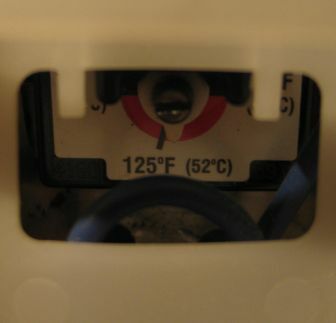 My water heater thermostat when I bought it was set at 140 degrees F. For most homes a temp. setting of around 120 degrees F. is all that is required. 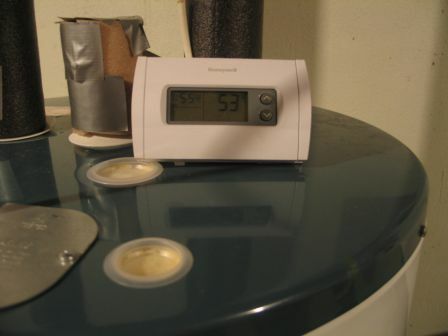 When taking down the setting for every 10 degrees F. you will save between 3-5% on your water heating costs. 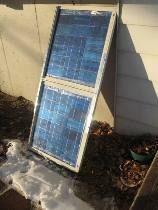 This is one of the easiest ways to save money on your heating costs. As you can see in the below photo I have set my thermostat to 120 degrees F. down 30 deg. from the original 140 deg..
Ok now onto the Water Heater Blanket. To determine if you need a water heater blanket you need to find out what R-value your insulation already is in your water heater. To find the R-value consult your water heater manual or it may be listed on the outer labels on your water heater. If you are able to find this information you should have an R-value of at least R-24 or above. If not at or above R-24 you will most likely need a insulating blanket. Be cautious to consult your manual or labels in case the manufacturer will void your warranty if you install a blanket. If you are unable to find the R-value information you can basically feel your water heater, if it is warm to the touch then you will need a water heater blanket. In my case my water heater is a bit warm to the touch and also in an temporary un-conditioned space(see temp gage below). So I decided that I needed to install a water heater blanket. 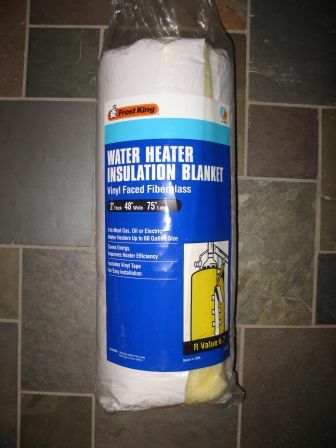 For my blanket I chose the Frost King 6.7 R-value hot water heater insulation blanket. Below is a photo of the packaging.